Art Deco was a glamorous European design style that grew out of the waning Art Nouveau movement in the first decades of the 20th century. Manifesting through new trends in architecture and interior design, the movement perfectly captured the spirit of the age: hope, progress and jazz. Naturally, when Art Deco made it across to the US, Americans made the style their own. American Art Deco also appropriated elements of pre-Columbian, Aztec, and Mayan design. They escalated the style into the massive skyscrapers that were to become the nation’s signature as images of the roaring twenties introduced the rising superpower to the rest of the world. Today, many of these classic buildings remain with six of the best American Art Deco buildings celebrated in this new series of posters. Built for a growing local Jewish population just after the Second World War, this synagogue is instantly recognizable from the outside by its colorful mosaic. This mosaic details scenes from the Old Testament, created by Hungarian-born artist A. Raymond Katz. Inside, three tall windows blend Hebrew calligraphy with the abstract colors and shapes for which Art Deco is known – a meeting of cultures across time. The Civic Opera House is an early (1929) example of Art Deco. You can almost see the moment where the style takes over from Art Nouveau in the gilt cornices and Austrian crystal chandeliers of the foyer. The 45-story office tower flanked by two 22-story wings gives the building, from the outside, the appearance of a vast throne. Sheltered by the largest half-dome in the western hemisphere, this monumental train station was built at a cost of $41 million and opened in 1933. Breathtaking mosaics by Winold Reiss commemorate 15 local businesses in intricate detail, providing relief to the classic geometrics of the arched roofs. Midway along the iconic highway 66, the Tower Station and U-Drop Inn rose up from the desert in 1933 to provide food and gas to weary travelers. A shift in traffic patterns nearly saw the end of the building in the 1950s, but it stands strong today. LED strips replaced the neon ribbon and a Tesla charging station was added to power the travel-stop into the future. The Paramount is a monument to collaborative creativity, unifying the efforts of a diverse team of artists into a consistent vision. Architect Timothy Pflueger is known for his iconic cinema designs, and the Paramount stands out as an Art Deco-flavored building that rejects all that came before it. It finds, instead, its own timeless style. 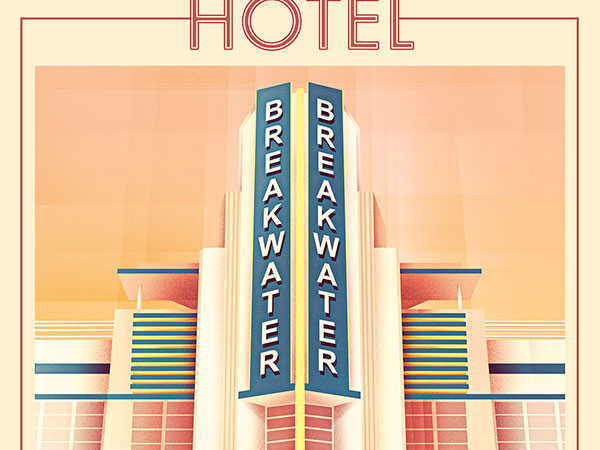 The ocean blue and flamingo pink of the Hotel Breakwater might seem like archetypal Art Deco colors, but the building wasn’t painted like this until the Miami Vice art department turned up in the 1980s. The ziggurat design and clean lines of the hotel are relatively modest, which is what makes it such a smart contrast for a district that is already rich with naturally-occurring forms and colours.